The view from their house in the Congo would be worth $1 million in the U.S. The small stick structure sits high in the hills, overlooking lush fields below and mountains in the distance. It seems like the most beautiful place in the world—if you forget the pain and suffering that has overtaken the area for 10 years. Between her children and grandchildren, “Mama” Chantal Sizikana has raised nearly 40 kids. She’s lived simply with her large family as a farmer for most of her life. But in 2005, a rebel attack forced them to flee everything they had known. Chantal’s daughter and grandsons enjoy soymilk that she made from soy she grew. While Chantal’s family was displaced, they received food assistance. Eventually, Chantal, her husband, and her children settled closer to home than the city they were displaced in, but they had to start anew. They built the small stick house in the hills, but they couldn’t wait for a new garden to grow before eating. They had to buy food, and to get money, Chantal’s husband farmed other people’s gardens. He had no time to start one of his own. Moise, Chantal’s toddler grandson, fared the worst. He became bloated, and white spots formed on his skin. She took him to the nearest health center, but the staff didn’t know what to do for him. They recommended her to Nyankunde Hospital, a medical center that Samaritan’s Purse supports by sending post-resident doctors and medical supplies. 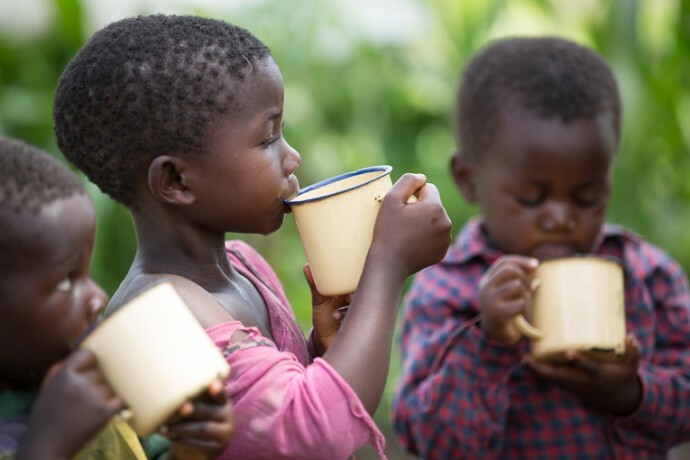 During his nearly two-month stay at the hospital, Moise received therapeutic milk and porridge. Also, Chantal, his main caretaker, learned how to diversify his diet to help him stay healthy. 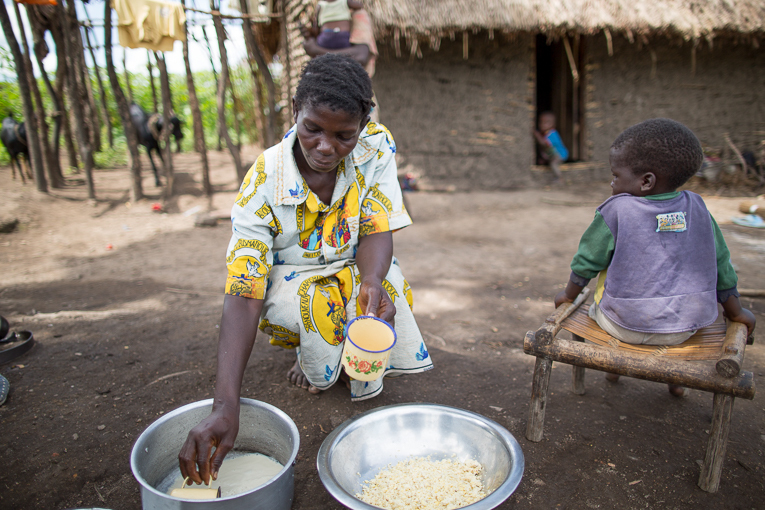 Chantal uses the soy that she grew to make milk for her children and grandchildren. “The education that we receive will help us improve the child’s nutrition, and we will still continue to farm so that we can provide food for our family,” she said. Learning how to care for a child and actually doing it can be two different things, though. Many mothers with the knowledge and desire to continue proper nutrition don’t have the necessary tools. That’s where Samaritan’s Purse helps. Chantal received eggplant, tomato, and pepper seeds from Samaritan’s Purse. The food supplied enough for her family with some left over to sell. She also learned better farming techniques and how to cook things that she previously didn’t know about. Chantal can now make soymilk and use different vegetables in recipes to keep the children in her family full and healthy. She also gave seeds to her neighbors and taught them some of the farming techniques she had learned from Samaritan’s Purse. She wants to ensure that other women in her community don’t face the heartache of having children with malnutrition. The war in the Democratic Republic of the Congo still continues in some areas, and Chantal knows that she may never return to the place she once called home. 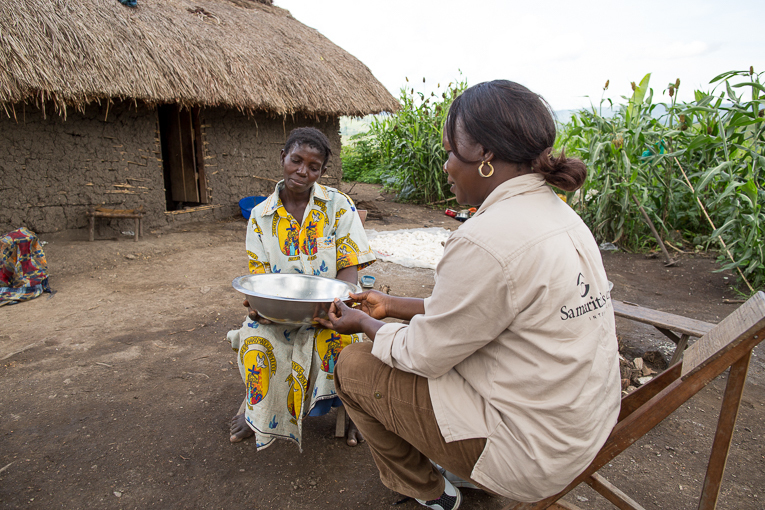 However, she is thankful that she no longer has to see any of her children or grandchildren suffer from hunger. “Thank you, Samaritan’s Purse, for providing us with seeds so we can take care of our children,” she said. Chantal talks with Samaritan’s Purse about the success of the project. Help a Poor Farming Family Working through churches and local Christian partners, Samaritan’s Purse provides farmers with seeds and tools that are appropriate for the particular soil and climate where they live. For a gift of $55, we can supply drought-resistant plants, fertilizer, tools, and training for gardeners and farmers as we sow seeds for the Gospel.